67 Sunday June 6th 1875. I helped do up the work this morning and then got ready and attended the congregational church with Rob. It rained a little about noon. Hattie took Winnie to the valley. I went over to Folsoms a little while in the afternoon. I helped get supper and after supper Hatt and I walked down to Robinsons We rode back with Gill Fletcher who was there. Cousin Anna came back tonight. Weather cool. 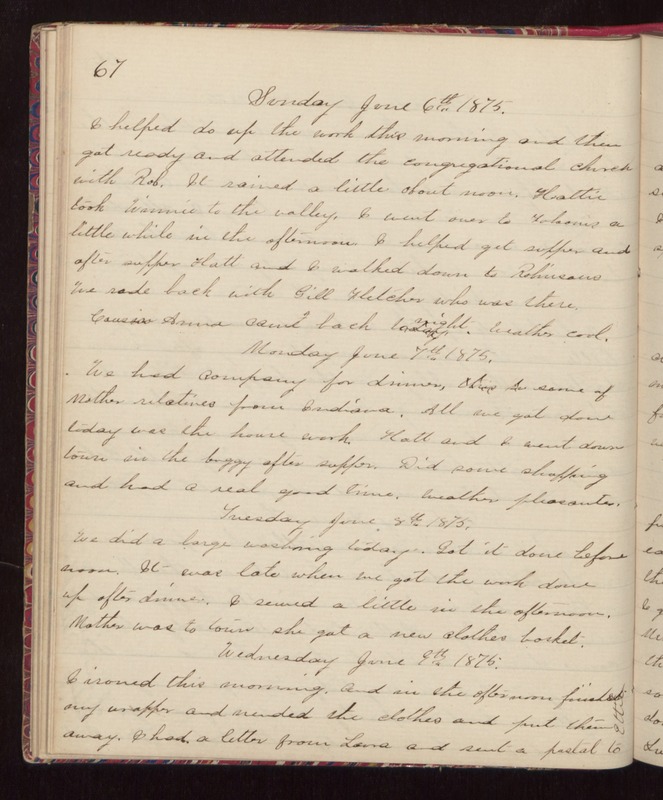 Monday June 7th 1875. We had company for dinner, some of Mothers relatives from Indiana. All we got done today was the house work. Hatt and I went down town in the buggy after supper. Did some shopping and had a real good time. Weather pleasanter. Tuesday June 8th 1875. We did a large washing today. Got it done before noon. It was late when we got the work done up after dinner. I sewed a little in the afternoon. Mother was to town she got a new clothes basket. Wednesday June 9th 1875. I ironed this morning. And in the afternoon finished my wrapper and mended the clothes and put them away. I had a letter from Laura and sent a postal to Ettie.